Your mother always said don’t slouch—turns out she was right. And she has science to back it up. 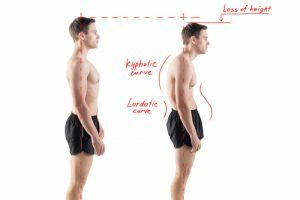 Your posture can have a profound effect on your health. Walking or sitting with a hunched back has been linked to a variety of health issues. Sitting in a slouched or hunched-over position, drooping your shoulders, or rounding out your spine while standing or sitting can cause pain in your neck, back, and shoulders. Many people who work with computers as a regular part of their jobs experience this to some degree. This posture problem is common in women who are pregnant women. Unfortunately, it is also more common with people that are overweight. In both of these cases, the added weight causes the body to shift in unnatural positions in order to support it. This postural problem can also be the result of inappropriate footwear. Feet are important! Take care of them by wearing shoes with good support. Wearing shoes without proper arch and ankle supports can cause flat feet and cause the ankles to roll. With poor posture, the calf muscles will tighten and your knees may even rotate inward. You may experience plantar fasciitis, pain in your toes, heel spurs, bunions, and hip problems. Weight loss can help and pregnant women can benefit from a pregnancy sling or pregnancy girdle to help with postural support. The human body was designed to remain in a certain position so that all organs can function as they should. When things are out of alignment it can lead to indigestion, heartburn, and even acid reflux. Practicing good posture can make all the difference in a lot of things…. even on the inside! As your Overland Park Chiropractor will tell you, when your spine is out of line it can cause headaches, dizziness, and a host of other issues. It puts your body under stress so even the normal processes like blood flow and organ function are thrown off kilter. When your body isn’t working as it should, the risk of serious conditions like heart disease, diabetes, and hypertension are increased. Many people don’t make the connection between good posture with a properly aligned spine and better health, but it is definitely there. Good posture may seem simple, like it’s not that big of a deal, but when it is practiced on an ongoing basis, it can be detrimental to your health. It isn’t worth the risk, not when the fix is as simple as sitting up straight! If you are looking for a team of experienced and caring practitioners, give us a call at 913-681-7757.